Gender Pay Gap Reporting 2017 - Exponential-e Ltd.
We welcome the Gender Pay Reporting legislation and are committed to ensuring we are doing all we can to minimise this gap. Exponential-e encourages all employees to be the best they can be, regardless of gender and continually strive to foster a culture of pride and excellence in everything we do. Our recent acknowledgement from the British Standards Institute as a world-class company is testament to this, as well as our Investors in People (IiP) accreditation. New UK legislation, brought into effect in 2017, requires organisations with more than 250 employees to publish their gender pay gap data. The data that must be reported is the mean and median gender pay gaps; the mean and median gender bonus gaps; the proportion of men and women who received bonuses, and the number of men and women according to quartile pay bands. The median looks at the central tendency of the market to sample, showing the middle-most salary of a sample. Calculating the median involves taking all salaries in a sample, lining them up in order from lowest to highest, and picking the middle-most salary. The mean is the overall average of the entire sample. How is this different to equal pay? Gender Pay Gap reporting is not the same as equal pay. Equal pay is about differences in the actual earnings of men and women doing work of equal value. We are confident that our equal pay policy at Exponential-e does not discriminate against any individual or group of employees. What are the reasons for our gender pay gap? We realise our gender pay gap is above the average in the tech sector of 25% and are committed to bringing this down. Three quarters of our workforce are male, sadly a common scenario within the IT and telecoms sector. 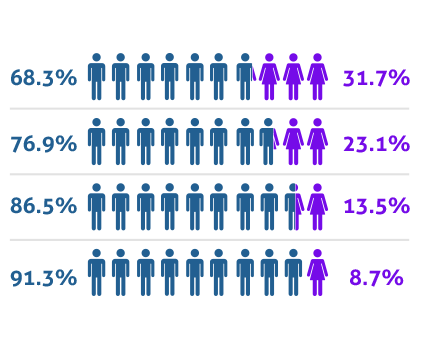 Upon further analysis of the data, we can see that it is the disparity within our technical and sales roles, traditionally male-dominated areas that is driving our gender pay gap. In fact, when we look at the data outside of these two areas, we see that we do not have a gender pay gap, with a marginal higher average for female employees, testament to our commitment to equal pay. To address our gender pay gap, we have a number of initiatives in place, to not only attract more female talent, but to encourage a more balanced, and rewarding workplace. After all, we don't want to just deliver Peace of Mind-as-a-service to our clients, but our employees too. Working with educational institutions to help attract more women into STEM focused roles. The data shows that the disparity in the bonuses paid is due to the fact there are very few women in senior sales positions. Last year we kicked off a Junior sales mentoring programme for both men and women, equally, to encourage progression into senior sales roles, especially for women. Training will be available to cover areas like Equality & Diversity, Unconscious Bias etc. We have established a Women’s Working Group who will assist in supporting the attraction, retention and promotion of our female talent across the business. Flexible working arrangements for all staff to encourage work life balance.